The idea that many 'terrorist' attacks are in fact carried out by government intelligence agencies is not a new concept (we here at Sott.net have spent the last ten years attempting to highlight the evidence for government complicity in 'Islamic terrorism' for one example). What is new is the idea that these government-inspired or perpetrated terrorist attacks are somehow doubly "fake" in the sense that some or all of the details of the attack didn't actually happen in any real sense. The idea is that, not only was the attack fake in the sense that government, not 'Muslim terrorists' or 'homegrown terrorists', were responsible, but that the apparent victims were fake also, their roles, where necessary, being portrayed by 'actors', presumably working for the government. The claim that 'crisis actors' were used in place of real victims has been made about the December 2012 Sandy Hook shootings, the more recent Boston marathon bombings and even the May 22nd knife attack on a British soldier in London. To clarify, the idea of 'actors' as it is being used in this context is not the same as 'media plants'. Media plants are people placed at the scene of a government false-flag terror attack who pose as 'eyewitnesses' to establish an official narrative for the media and public. 'Actors', on the other hand, are people who are supposedly part of the false-flag attack itself and who pose as victims of the attack but who are not really injured at all. The Sandy Hook massacre last December seems to have been the first major event where the 'actors' idea gained traction. Within a month of the massacre, there were literally hundreds of Youtube videos and articles supposedly providing proof that the parents and neighbors of the victims were actually crisis actors and, therefore, the entire event was probably staged and no one was killed. The 'hoax' was, it is claimed, a crass and obvious attempt by the government to impose 'gun control' on America. Many of the Sandy Hook hoax videos have received tens, and sometimes hundreds of thousands of views. I wrote about the implausibility of that particular 'actors' theory here and tried to compile the best evidence for Sandy Hook being a US intel 'black' operation here and here. Despite my efforts, (not that I ever expect them to make much difference) the 'terror attack actors' idea continued to gain pace and made a serious reappearance at the Boston Marathon bombings. 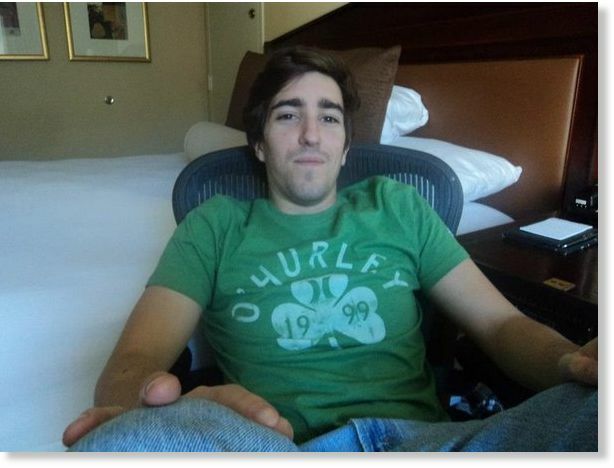 The main 'evidence' for 'actors' at the Boston marathon bombings centered around one of the victims, Jeff Bauman. Bauman is the guy whose picture was sensationally splashed across media newspapers and websites as he was taken from the scene of the bombing in a wheelchair with the bone of one of his severed legs protruding. I'm pretty sure half the planet saw that particular image. Proponents of the 'actors' theory seized on this image as hard evidence that 'fakery' was afoot. After all, where was all the blood that surely should have been spurting from his leg? Even in the immediate aftermath of the bomb, it is claimed, pictures of the scene are devoid of any significant amounts of blood and certainly no spurting from Bauman's leg(s). Disbelievers also pointed to the color of what blood there was on the ground, citing it as evidence that obviously fake or 'stage' blood because it was just too bright to be real. Some pundits even pointed out that there were different colors of blood from one image to the next! And what about those people around Bauman? One guy seems to be putting on his sunglasses just seconds after the bombing! Surely all of these details constitute 'slam dunk' evidence that the Boston bombings were faked in the sense that 'crisis actors' were used, at least as part of the operation? The problem with this theory is that it has no legs, so to speak. It seems that not one of the advocates of the 'actors' theory bothered to think about the implications of their claims. If they had, they would have been quickly confronted with some rather implausible conclusions. For example, if Jeff Bauman was, as is claimed, an 'actor' who was already an amputee and was fitted with the bony prosthetics immediately after the bombing, how do we explain that none of his family or friends have spoken up and pointed out that Jeff couldn't have lost his legs in the bombing because he lost them several months or years ago? Jeff has been widely feted in the media in the months since the bombing, and made a surprise appearance before the Boston Bruins ice hockey game in early May. A few days ago Jeff threw the first pitch at Red Sox game. Surely someone who knew him as a prior double amputee would have said something? Then again, maybe his entire family and friends are intelligence operatives too and in on the plot? Maybe Jeff was a 'deep cover' intelligence operative with no public history before the bombings and all of the google images of him (many with legs I would add) that appear to go back several years were planted on google in the run up to his prime time exposure in Boston? Or maybe all of his family and friends were somehow silenced or 'paid off'? Bauman seems to have been associated with 'Team Stork' which appears to be a marathon running team made up of members of the Brigham and Women's hospital, a teaching hospital of Harvard Medical School that is located in Boston. Here's an image of him with some Team Stork members. From what I can gather, Bauman's girlfriend may have been running in the race as part of 'Team Stork', and she may have been a student nurse at the aforementioned hospital. Alternatively, she and Bauman may simply have been friends with Team Stork runners. In the image below of the scene immediately following the first explosion, the woman in the foreground is wearing a shirt with the blue 'Team Stork' logo on it. She may have been with Bauman as they waiting were for team members to cross the finish line. The above image shows quite a lot of blood on the ground. As noted, many 'actors' theorists have claimed that this blood is "too red" to be real, despite the fact that there are at least two shades of red blood on the ground. A little research into blood color would quickly have informed such theorists that oxygenated blood is bright red, while deoxygenated blood is a dark (or darker) red color. I would have thought that most people would have at some point in their lives had experience with the color of blood, if only their own, in terms of a small cut. Doesn't everyone know that fresh blood from your finger can be a bright red color and dried coagulated blood is dark red, almost black? In fact, depending on where and when you cut yourself, your blood can be a brighter or a darker shade of red (see the aforementioned oxygenated or deoxygenated blood comment). Not enough blood? Wrong color? What about this one? Actors? Stage blood? Then there is the image of Bauman himself and his protruding femur. 'Actors' theorists were quick to point to the 'evidence' that there is very little blood on Jeff's leg, either in the images immediately after the bomb went off and also when he was being wheeled away from the scene in a wheelchair. I've spoken to several practicing doctors, all of whom have experience of serious trauma victims. Not one of them were surprised that there was not a large amount of blood squirting from Bauman's wounds. What most of them did say was that they had been surprised at the lack of blood when they first encountered trauma victims early in their careers, but that they were quickly able to understand it based on their prior knowledge of human anatomy, and that since then, they're never surprised at a lack of blood loss in trauma patients. In Bauman's case, the 'actors' theorists claim was that, since his femoral artery was "severed", there should have been massive blood loss and he should not have survived. The problem here is again one of a lack of cursory research by those promoting the theory. Even in the case that his femoral artery had been severed, arteries are sphincteral, that is to say, they spasm and contract when severed. This appears to be a natural life-preserving function of the body to prevent blood loss. When arteries are compromised, coagulation factors are also released that facilitate the formation of thrombi which minimize blood loss. Just like the formation of a scab over a wound. It is such an effective system that blood thinner drugs are often given to prevent the formation of these thrombi during surgery on an artery. There are other arteries in the lower leg (the anterior and posterior tibial arteries) but these are not major arteries and if severed, as in Bauman's case, would very likely have spasmed resulting in a fairly quick reduction in blood loss. In addition, the man in the cowboy hat (Carlos Arredondo) had tied a tourniquet to his mid-thigh area, further restricting blood loss. (By the way, the reason Bauman was evacuated in a wheelchair was because there are usually many wheelchairs at the finish line of races for people who really shouldn't be running marathons to sit down in, before they collapse). The following images were taken by a person in an office on the first floor of a building directly behind where the first bomb went off. Two photos appear to have been taken every second (the person probably just held down the shutter release button). You can see the full sequence here. 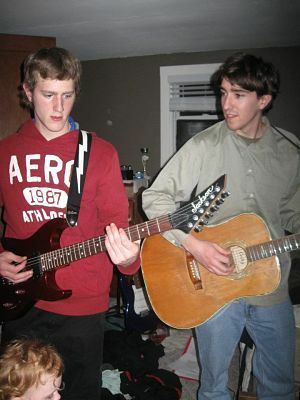 These photos, along with a video of the bomb exploding (see below), provide fairly conclusive proof that Jeff Bauman was at more or less 'ground zero' of the explosion, and that a bomb really did go off. The first image below shows the scene immediately after the bomb went off. Bauman and a few other people are in the center surrounded by a cloud of smoke. As the smoke clears in the subsequent images, you can see Bauman lying on the ground with his back to the camera. There is a man with a black and grey hooded top (the hood is grey) right in front of Bauman. This is 'sunglasses man'. Take note of the man running on the road in the top right of each photograph. He is wearing a black or dark blue running outfit with white short sleeves. He is also wearing pink socks (we'll call him 'pink socks'). He can be seen in the video below reacting to the bomb. Here's a still of the man I'm talking about. b) that Bauman and others were at the site of the explosion. a) manipulated into situating themselves at the site of the bomb (of which they had no knowledge) and then, when it did explode, causing them injuries, they proceeded to carry on with their role of "actors"
b) part of the bomb plot and agreed to place themselves at the site of the bomb, and their lives in danger, so that at least one of them could produce a prosthetic leg with protruding bone for later public viewing. Bizarrely, this scenario is preferred by many over the scenario that the real bombers would have more likely opted for just detonating the bombs and creating real casualties for public exposure. Clearly the real bombers have no consideration for human life, because three people were killed, one of them an eight year old boy at the site of the second bombing that went off 10 seconds after the first and 100 yards away. Unless, of course, we are to believe that those three were also "actors" and did not die at all and were part of the "staged event", their families and friends either in on the plot or 'silenced'. There seems to be a thread of "fakery" claims that run from 9/11 (the 'blue screen planes' theory) through Sandy Hook (another 'staged event') and Boston which, when looked at from a broad perspective, seems to have been deliberately invented and disseminated in order to discredit the serious evidence for government complicity in these specific 'terror' attacks. The NY Times ran an article stating that virtually all previous "terror plots" that were "foiled" by the FBI were actually created by the FBI. "I did that, and I just killed a policeman in Cambridge." So basically, the only real evidence linking the brothers to the bombing is the claim by an unnamed alleged hostage that the brothers made their bizarre confession to him that they had killed Collier and were responsible for the bombing. "Officer Donohue of the MBTA Transit Police remembers almost nothing of the night he was shot during chaotic gunfire on a normally quiet Watertown street, or of the murder of his close friend, MIT police Officer Sean Collier, hours before in Cambridge." Do you know who J. D. Tippit is? J. D. Tippit was the Dallas policeman who was allegedly shot by Lee Harvey Oswald. The shooting of Tippit was instrumental in framing Oswald, at least in the public mind, for the murder of Kennedy. Jim Garrison stated that, "If Oswald was innocent of the Tippit murder, the foundation of the government's case against him collapsed." And indeed, it appears that the Warren Commission ignored a lot of evidence in the form of conflicting eyewitness testimony that strongly suggests Oswald did NOT kill Tippit. That's just some of the hard evidence that could be used to make a case for the Boston bombings being a govt. operation. But when you add in the idea that the bombings were actually 'staged' by 'actors', and proceed to back it up with very subjective 'evidence', virtually all of which can be exposed as bogus, thereby making those who claim it as 'evidence' look like fools and/or liars, well....you've destroyed any usefulness of the hard evidence by associating it with the bogus evidence. For me, therefore, the 'actors' and 'fakery' meme is more than likely a deliberate attempt to do exactly that. Of course, there is the other all-important element, without which government/intel attempts to spread disinformation would be useless i.e. the many, many individuals who have bought the story and disseminated the disinfo. I don't for a second believe that owners of respectable websites like Globalresearch.ca and many respected bloggers are consciously playing a part in the disinfo campaign, but the reality is that they have been aiding and abetting what is most likely a COINTELPRO operation by giving the 'actors' theory legs (so to speak). I won't pretend to know why such previously sober and serious journalists and authors have uncharacteristically been taken in by a con-job (and a rather obvious one at that), except to hypothesize that, as the world continues to spiral down into ever-increasing lies, social hysteria and madness, we may expect to see more and more people begin to 'lose the plot' in more ways than one. Guess I don't keep up on this stuff. From what I'd heard in the past, actors are used, but only for training site practice, though many of the 'actors' even there are personnel themselves taking turns as the 'local people' depending upon the training site. I've never heard of using real actors in a live mission, as they couldn't be trusted to keep their mouths shut and would love to talk to the media, as it couldn't but help their careers to get more attention. I don't understand the reason to use 'actors' in a live situation, wouldn't the presence of so many 'trainees' be enough? Seems the clusterf### of personnel was way more than enough and no doubt lead to the need for some silly willy to throw out this 'actors' nonsense. A simple check with Equity would suffice to prove that wrong. Can you just imagine the chatlines on Facebook by all the 'actors' and friends of friends of friends if there where any? The servers would crash with the overload, which is not happening as reality turns most people off, thus the need for advertising and saturation coverage etc. Of course, you could say those brothers were 'actors' if the uncles' CIA connections are true. Stupid, uninformed 'actors' who don't have a clue about what's going on... probably were just given the usual 'call' to bring/wear a certain type of clothes, bring a certain type of bag, and if unable, they will be provided for you by the crew. No wonder that 'Third Man' had to be disposed of recently. You could say his interrogators were 'acting' when they told the media he made an attempt on their lives and they had to, just had to stop him... as in kill him with 'closure' to the back of the skull.... 'dead men tell no tales' don't you know. The whole thing seems like a farce which gets worse with each retelling and each performance. Maybe intel needs some real actors to give them an idea about how to run a real 'show'? Dustin Hoffman would be much better than that kid they gave the Friend of CIA award to a few weeks ago. His wife is famous for playing one on tv a few years back as well, how coincidental is that? A match made in Heaven or Hell? You've been missing out gdpetti! Since the bombings, it wasn't possible to look up any alternative theory on Boston without immediately running into a morass of "actors" and "fakery" articles, videos etc. And I'm not exaggerating when I say almost every single alt. news site that commented on it bought the "actors" story. My jaw was hanging down round the floor for days at a time! I actually opposed the actors assertion initially - I thought it was misdirection designed to cover up the truth (along with claims that the prinicpal from S Hook was involved etc) - that is until it was proven beyond any reasonable doubt that the situation with the guy being wheeled away was without doubt stage managed. So the question then becomes - what is the motive of this article? Have you ever been in a sudden traumatic situation like this? Ever heard of shell-shock? Have you read Peter Levine's book 'In an unspoken voice'? You clearly have no idea what you are talking about on this point, and your judgement that it was "without a doubt a set up" is completely based on subjective nonsense. Where's the critical thinking gone dude? Really drives home the point that NOTHING should be taken at face value, and that it is far easier than one can imagine to manipulate public opinion. Dis-info is and has been an ongoing operation for many years. Too bad the actor theory has gained so much traction so quickly. As a Democratic U.S. Congressman said to me years ago after they took out Aristide in Haiti: "It's MUCH worse than you think". I second that. Great article that pulls the 'actors story' apart. No need to have actors when there are so many innocent victims available and patsys to be 'set up'. Perhaps the only 'actors' were the actual bombers? I must admit I was expecting to see something a lot sooner on a much 'grander' scale. I guess the gullible public might has ended up smelling a rat, if they'd done that. Joe thanks for the update and background info on this obvious Cointelpro operation.The alphabet boys and girls are getting sloppy and careless but they do have a plan. As you suggested the government intel operatives are aware that more people are waking up to the way certain terror incidents are becoming too familiar in detail,so why not add a new wrinkle to the analysis and discredit any one who truly gives an detailed analysis of any future terror incident.And there will be more unfortunately.I would say let us hope that the pathological events stop but I do not want to sound like a parrot for the Obama administration,hope and change indeed!! "In addition, the man in the cowboy hat (Carlos Arredondo) had tied a tourniquet to his mid-thigh area, further restricting blood loss." I didn't know that. So, I was wrong about Carlos. That is good to know. Thanks Joe, for unravelling all this. It was highly needed, OSIT. What is an actor, really? The thing with this whole thing is that we can't be 100% sure. How can we really? But I guess one can build a case and use critical judgement and thinking to arrive at a conclusion that seems plausible. You can make a case that there were actors there. It's just a matter of perspective. If any situation isn't genuine and there are people there that know it isn't, then they have to play the role of actors if they are trying to sell it as what it isn't. "A person who behaves in a way that is not genuine." So for example, if the incident was in fact carried out by others, not the brothers, then those others must have had some people on the ground, feeding the media stories, running the whole show etc. In this case, they played the role of a director, directing the whole show to play out however it is they wanted to portray it to the public. It's not inconceivable that some connected with them gave fake interviews, planted fake evidence etc. However,you can also say there were no actors, just like how joe said above. It just depends on what you take an actor to be I guess. They can run whole shows in public with real life people without much problem, look at the medical trials they did or might still be doing on unsuspecting people in real life environments where for example the doctors are actors but the people undergoing the trials are real people with lack of knowledge of what is happening. Good comment. See my comment below, which I am about to write. Luke, I'm not saying there were no media plants, or people involved in the planning and executing of the bombing, there undoubtedly were. What I am saying is that there is no hard evidence that Bauman or any of the other victims were "actors", and I am also saying that there is no logical reason for the perpetrators of the bombing to have used "actors" in place of real victims. In fact, I am saying that it massively complicates the plan to detonate a bomb at a Marathon to have "actors" instead of real victims. Thanks for the article Joe! of a YouTube video with 93,000 views called “JFK Assassination Lie” that I watched a few months ago which claimed that actors, sometimes famous actors, portrayed various historical or political figures. The video claims that the shooting of Lee Harvey Oswald (played by country music singer Jim Reeves) by Jack Ruby (played by a brother or close relation to country music singer, Tex Ritter) was a staged event with all the newsmen standing on their marks. None of it was real. The video connects actors with political figures by facial resemblances, ear biometrics, handwriting analysis or similarity of their wives. I was actually considering the possibility until the total ludicrous claims of it appeared overwhelming: Kermit Roosevelt played both Walt Disney and Hitler. It turns out, not surprisingly, that the maker of this video also has a web page “The Marathon Mayhem HOAX” where Pete Townshend (from the “The Who”) plays the bombing “suspect's” father and deceased actor John Candy plays Boston Police Commissioner Ed Davis. I kid you not. When you think about it, the actors meme has the effect of massively enlarging the numbers required to be 'in on' conspiracies. Now, this just so happens THE major protest people make when considering evidence of government complicity in crimes: "But too many people would have to be in on it!" In reality, this is not true. A few psychopathological conspirators with a lot of power and influence over others can do a lot of damage, provided that they understand human psychology and can anticipate how people will react during and after carrying out atrocities. By significantly inflating the numbers of 'conscious conspirators', the 'hoaxers' are hitting the sore spot that prevents most people from ever looking beyond the official narratives. Actually, maybe that's what we need to call them from now on. They're not 'Truthers'; they're Hoaxers. I believe Chiarrini has started the actor scenario not only for these events but for many many cases. The thing that buffles me(being a slave of E.U. colony greece and not having the ability to see the scenery myself) is that I've become too cynical, thus I do not believe anything the MM is showing. The same thing with boston. All the Mass media here covered the event in a very mainstream way which made me a non believer. Everything looks like a tv show. Including the internet nowadays, or at least the surface web which steadily has become another mass and corporate medium. The above are just thoughts on this subject. Adding to the conversation. If anyone is interested in a more in-depth look into this subject see what McGowan has to say. Make up your own mind. That's exactly what's gone wrong here. It's part of the same schizophrenic break from reality that the New Age movement went through. Instead of Truth, there's 'my truth, your truth'. It's very troubling to see it happen to otherwise rational observers. Truth is not just facts and rationale (ie., rational acts).. I think you're stuck on that. Truth being facts and things that make sense. Let us note (notice) how much things have 'improved' since the Zapruder film. Can a football player be an actor? Can an actor be a football player? Those who live by the camera, shall perish by the camera. p.s. Hey, any you guys seen my old footage from Southern Cal? Man, I really put some moves out there. Money changes everything. Yeah, baby! Yeah, man, alright. This is a bit out there but I believe it is what money represents that changes everything. You can get it by having a lot of money but you can also get it by other means. At the end of the day, if you have it, chances are, you'll sell your soul to the devil, whatever that may be. Maybe this is what Jesus meant by rich men and eyes of needles? Hi. I don't know too many of the regulars here (at Sott), but it appears you are one. Scrolling down, through further comments below, it appears you wrote something that the all-important editors found too offensive and therefore deleted? I am very disappointed if that is true. Not that you wrote something deemed too offensive, but that it (your comment) was censored. Wherever I go, I always challenge the owners/controllers of the websites I visit to further free speech, rather than imitating the actions of the various governments by allowing only certain expressions, claiming for example (as Sott might be guilty of) the intellectual, rational view only as proper....NO HATE SPEECH, NO EXPLETIVES or BAD WORDS. NO EXCESSIVELY EMOTIONAL CONTENT. This is why I give Naill 'the Egghead' a little jive. And I call him and Joe, the Righteous Brothers. I continue to roam the internet, in search of....? Guess I am out of touch living here in the boonies of rural America, but then most people here don't pay attention to this so-called 'alternate media' anyway, the usual MSM propaganda specialists satisfy their appetites quite well usually, and after all, we are simple folk and not the pseudo city intellectual types that love to parade day and night in their beloved reality tv shows, as the loud mouth talk show hosts on radio and the tv fill up our stomachs to overfill already. How many people that watch the media circuses are used to seeing real blood anyway? Most are accustomed to the Hollywood variety and its associated special affects crews at work so perhaps we consumers of the 'arts' aren't the best judge of what is or is not Real? I do feel a wee bit left out of this 'acting' scenario, but it seems I've already filled up on its tasty concoctions of BS through the years and perhaps its age that removes the excess words and replaces them with silence, or perhaps its just that rural sense of when one is being served the BS plate special from the diner at mealtime, but I just don't see the attraction, though I do see the distraction factor quite clearly, but that is so 'old-school' that it just makes you smile, for isn't it the 'actors' that are presenting this scenario in the first place? Always the 'method' style these past decades, and perhaps they are losing themselves in their characters? Hasn't that been referred to as 'personality fracturing'? It seems to be a popular meme these days and always hot on the plate at your local diner. Yummy, yummy, in your tummy till it makes you icky, icky and very sicky and need to throw up, but without any real nourishment in your tummy, its the dry heaves for you and that is one experience I care not to repeat, nor act out. I have searched and so far have been unable to find any photos of Jeff Bauman taken before the bombing showing him with two legs. Anybody got one?? For two examples. I think there are others, including the image of him holding the sign in the article above. The government has been questioned by people as in conspiracies for a long time for good reason. One reason is that when the twin towers incident happened they always had someone to put the blame on when no one took the blame and they didn't have time to investigate into the matter. Thus people saw that as a scam with a prearranged fallguy. Plus after that the FBI which was the only branch in Security was loseing agents in checking to find out if the plague that was being sent by mail to people after looking for the possibility that it was of American origin. The FBI questioned things that the public was told about. CIA involvement for instance. And as to whether or not It was done as said. The thought was brought out that it was those who the government supported against the supposed guilty party in Afghanistan was actually the one's who did in the twin towers and the attack on the pentagon. Also under CIA orders. Even a Florida newspaper was questioning all of this. The sudden creation of Homeland Security no doubt made their suspicion worse. Now with the gun buy back no doubt more and more people are suspecting the government as working against the people. A nation with a public unable to defend itself against terrorists at home because they aren't allowed to possess guns points to trouble. Naturally that builds more distrust. One needs to realize that if there had been such conspiracies in our government it wouldn't have been with the whole government involved. After all The FBI couldn't have been involved in it for they were loseing agents although the CIA wasn't. And if other parts of the government are doing such one should ask why? They seek more power it shows. Why though? Are people fantasizeing or is there really something in it all? And if it is real and not fantasy what do they think that they can do about it. You can't win against the government or the rich. They have the power and the money to do anything and to cover up anything. So why fight them. They win in the end. And fighting them can be dangerous. The FBI agents wh was killed investigateing into the Twin Tower affair could tell you that. Besides as I always heard it a person is innocent until proved guilty. And as the bible says judge not lest thou be judged. To judge is to play god. To kill is to play god. That's why Jesus said judge not and do not kill. God will do the judgeing. The wicked will reap their just reward. And it won't be eternal Heaven. I don't see much debunked here. Grant you, there is a very bad habit of connecting the dots going on, but the dots themselves do appear to be red flags for something very strange afoot. You state, the bomb was real and leave it, like that terminates all anomalies about this explosion. It seems like we're all worried about the first baby-steps of the conventional thinkers outside the box. Got news for you. They are a massive liability if they switch sides too. I somewhat hope the it's all okey-dokey types mop up the tranquilizer kool-aid before they stampede for all our sakes. Critical thinking requires growing brains more than just using what you have, yet what seems to be the hope of the underdogs, is that we'll just instantly join forces with our new friends. These anomalies are going to lead to obnoxious, alienating discussions until a new level of precision in information gathering is demanded of every subject available for discussion. Since we are subjected to a non-self-correcting stream of data combined with obscured players making definitive statements, it's going to be a spectacular bit of mayhem when questioning the official story starts. Trying to protect people who are not hardened questioners is probably a negligible option. Until new standards for information are adopted by all, feeding people who will believe anything speculations that question the party line has its disruptive functions that are both harmful and beneficial. We're stuck with a learning process in a self-and-other censoring society. I respect what you're demanding but I don't see how what you're writing addresses the central anomalies of the event. Alright then. I suppose I'll have to spell it out. Watch this space. I will, and thank you for offering additional clarification. Just a suggestion, but why don't you invite McGowan to be a guest on your webcast. "the central anomalies of the event." What do you think are the central anomalies of the event? No, I think it terminates all anomalies about it being real, not any anomalies which surround it. But then, if you were a branch of some part of the government that was doing this to your own people, you'd want to discredit any person/group that was trying to 'figure it out' as well as distracting and misleading any people who were begining to think 'outside the box' and figure you out too. This would be a logical thing to do, should be expected. In addition you'd want to send people in to websites, as trolls to support the wacky disraci 'theories' to further obviate and mislead. This should be expected and will probably become more obvious as time goes on. All just part of cointelpro. Thank you Joe. Very good article. I'm just amazed that the majority of people are so fixed on the leg injury and blood analysis. What? Nobody looks at the faces anymore? If someone would just look at the face of Jeff Bauman in before and after the attack photos, he/she would see how his face changed. He looks exactly like a person who just several minutes before suffered a very traumatic injury. And if someone is insisting that it's not his leg, but a prosthesis, just look how his thumb presses into the flesh, when his holding his injured leg. Do anyone knows a prosthesis that can produce the same effect? I do not. I think this attack was specifically designed to maim, to cause these horrific injuries, and so much to kill, just for this numbing, hypnotizing and mesmerizing effect it produced in many people. And how come that people seem to have lost all their compassion for the injured and killed? Just stop for a minute, and think, how would you feel, if something like that happened to you, and multitudes of people started to accuse you of being a fake? For example, in the video that Joe mentioned above, posted on Dave McGowan website, the person making so-called analysis is chuckling and laughing! It's simply disgusting! Did you read McGowan's 7 part series? If so, what did you think of his work. BTW, McGowan had nothing to do with the youtube clip and does not represent his work. Hi naturalden, I read several parts of Dave McGowan series when they were coming out (in the beginnings of May,) and the title of series was "The Curious Case of the Man with the L-Shaped Leg". Now, the title is "The Curious Case of the Man Who Could Only Sit Down". I wonder, why is that? I just looked at the first part of the series with a new title, and it's not the same in the overall impression, although I can't point out where the text was changed. I'm well aware that McGowan had nothing to do with a clip posted on youtube, but he included it in his analyses as an addititional "proof" that his theory about Jeff Bauman being a fake victim, and that nothing really bad happened to him, was true. And it's really sad, because I read his other series of articles on several subjects, and he seemed very diligent and reasonable in his research. I was really grateful that he researched and brought to light the hidden forces behind well-known events, that I've never even suspected before. By the time I found McGowan's take on the Boston incident he had named his series: "Special Report on the Boston Marathon: The Curious Case of the Man Who Could Only Sit Down." I'm not sure why he would change the title. Do you think he had an ulterior motive for doing so? I'm not sure making a determination on the value of a 7 part series by concentrating on one small item is fair to the author. Especially one who has a track record of putting out credible work such as McGowan. Taken as a whole his series on the Boston Marathon raises some disturbing questions. It is well worth reading in it's entirety IMHO. Hi naturalden, the answer to your question, if McGowan had an ulterior motive, when he changed the title, is "I don't know." But it seems very strange to me. Maybe, It's a small issue, maybe, it isn't. Again, I don't know. When he is distorting the facts or presenting them in a way, consciously or unconsciously, just to prove he's (or someone else's) "actor theory", it's not a small issue. It's a big one. I will definitely read his material in it's entirety. And that's all I have to say at this point. I agree, no one is infallible. What Joe has done here is really important. Please you all, don’t get caught up in a whole back and forth ‘this detail is clearly faked, this isn’t’ waste of your talents. Rather, step back and see the big picture. For Joe has highlighted the palpable absurdity yet depressing reality that when things become this bad, even people seemingly seeking the truth will eventually prefer to dive headlong into the mire of fantasy rather than face facts. The game players of the ptb are playing the field with the sureness of touch all their investment in cognitive science has given them! They know us. They know what humans do when faced with increasing levels of intolerable stress. They understand (because after all they are the source of this programmed stress) that after years and years of dietary manipulation, environmental degradation and mental pan frying via mass media culture and electro techno smog, that the lines are blurring between cognitive clarity and stress related delusion. The breakdown of thinking is taking place. The meltdown within is accelerating and they want to push that plot line onto its next level. All they have to do is signpost the way and hey presto! The magic ingredient is cul de sac fantasy as a way out from the never ending freeway of harsh reality. The very ‘truth seekers’ do the work for them by not grasping that they themselves have NOT DONE THE SELF WORK required to CLEAN THEIR OWN MACHINE of their underlying programmes and hence be in a clear space so as to be able to rationally analysis the evidence in any other way than in the programmed manner their puppeteers expect. Because the equation of ‘madness’ and distortion from the ptb has become so seemingly way out there, because the horror of this reality is too much to bear, (especially when you are already alone and heavily ponerologised by the totalitarian boot pressing down on your isolated consciousness), because you can’t bear to believe that the ptb are this clever, this manipulative this ahead of the game that they have near total control over your world and the ‘truth’ within it, it actually protects you if you can convince yourself that it is not actually ‘real’, that it is faked, that ‘real’ people didn’t actually die or end up maimed for life. If it is all fraud then nothing really important is taking place here. Real lives are not ruined. You do not have to weep and gnash your teeth at your impotence in the face of such brazen, psychopathic tyranny. You do not have to face the fact that you done nothing to prevent it. Rather you can talk endlessly about the fakery of it so that no real emotions of empathy, or anger or shame ever get a hold of you and leave you bereft and bereaved and either awaken your dwindling humanity or succumb in the attempt! Heavens, no! Life as a perpetual Hollywood film set fits more snugly with the underlying view of the madness of it, rather than the cold, stark, dark truth that yes they can butcher real people in broad daylight and in front of the glare of the camera and get away with it – EVERY SINGLE TIME! It becomes a blessed escape from facing the real horror of the scale of the grin on the face of the beast as it feeds so publically on us all. maybe it is a numb comfort to think that everything including me, I, family, death. life are simulated illusions, a lucid dream. It surely is comforting. Especially when you take a look at the future and present and past for that matter. It is depressing. By even the thought that this devastating attack could by a hoax and the victims sustaining devastating, life impacting injuries in some cases, were performed by actors. Thanks Joe for your clear and concise article. This brings to my mind the much deeper issue of society, the numbing of emotions and empathy for another human being that is suffering and the inability to recognise that suffering in another. The Boston Marathon was a Real life situation with many hero's, the guy in the cowboy hat, Carlos was just one of them with his quick thinking and interventions, he saved Jeff B's life. That is a demonstration of humanity and concern for another. We have definitely lost our way when we no longer recognize those emotions, to my mind they are the most basic of human instincts caring, compassion and empathy. People probably wondered how Bauman got a wheelchair so quickly after the bombing as seen in that picture. Have they considered that the blood wasn't spurting though because he was already low on blood and it was caulderized already? He looked awfully alert in that picture as if he never suffered a loss of blood some may say. He might have had that look though because he was glad to be alive though. Looks can be deceiveing so one can not say that look was out of place or normal. Only a search in his past medical history would tell a person anything. I didn't see any such search being done though. In that picture he with Team Stork members he could have been standing on artificial legs or real one's either one. Our's is not to judge though. Judgements too often turn out lies. A person needs to get facts and not give out false judgements. Judgements or possibilities should not be broadcasted. Only proven facts should be. I see none of those being shown. So many it's as the bible shows that the one who judges needs judged. True investigation is not judgemental. I see none of that here though. Pressure cookers can be very dangerous things. If you don't believe that see that one is used in your home that can't release it's pressure. You'll be surprised at the amount of destruction you'll see. If you're near it when it goes off it could easily kill you. Rip you apart. Just like it would do the wall. Many a person has died from the use of pressure cookers which couldn't release pressure. Anyone in the vicinity of one going off wouldn't be putting on a act when they act hurt and maimed. They really would be hurt and maimed. If a bunch of pressure cookers was to go off it'd be even worse. They'd be lucky to be alive if they survived the one going off. They couldn't survive more than one going off. I can't imagine more than one going off at the same time. They don't build up pressure at the same speed and they wouldn't have had the pressure blocked at the same time I'd say. So it would be that one going off would set the others off by it's explosion and not by the building up of pressure in them. Thus deaths would be lower in numbers if such happened than if it had been all explodeing at a certain time under their own pressure. So the actor theory is crazy if a bunch of pressure cookers actually went off. If you don't believe that you can plug up the pressure release on one you're useing and watch it blow up. It'll probably be the last thing you'll do if you do. That way though you'll see just how dangerous they can really be though. Of course your upper torsil could be on one side of the room whilst the lower torsil is on the other side. Before you judge things get the facts. Investigation is not judgement. It's inquiry. So inquire. Don't judge. People do too much judgeing and not enough inquiry. It was a terrible event for Bauman, nothing Im going to say is meant to undermine that. The photos of Baumans face in the wheelchair dont match the facial structure of other photos. This is very evident in the height of the cheeckbone, the hollowness of cheeks and other features. There is no mistaking this. fibula is too small in diameter or apparently missing in some photos. All tendon, periosteum and muscle and fascia appear removed from the bone. The tibia and fibia lack the malleolus enlargement but lack an end break, thus the bone structures that would form the joint with the talus appear absent yet the bone is not shattered at the end. If you add the length of the malleolus and articular surface, the tibia thus appears too long and high aspect ratio. I would estimate it to be approximately 6 inches too long. The axis of the patella/tibial tuberosity and the exposed tibia do not align correctly, although this is a lesser point. Bauman appears very well poised, maintaining balance and posture, and obviously not in shock while in the wheelchair. All video and photos I have seen show no change in facial expression, excluding expected features like shaking, grimace, trauma or shock. Not at all what you would expect. Full recovery from amputation was too rapid. All photos show a man without any emotional or ambulatory effect of a recent double amputation. He looks exceedingly healthy and well adjusted in hospital photos. I found this article, the Forum discussion, and the SOTT Radio Show on the "actors" topic very revealing of how easily I, and many others, can be swayed to see incidents, and media coverage of those happenings, in a limited, manipulated manner and overlook logical paths of inquiry. Because I have found much of McGowan's work to be credible in the past, I made the the logical fallacy that this current report must be as valid. Like someone said earlier, ANYONE who is not working on "cleaning his or her 'machine'" which includes networking with others more advanced in the process, is subject to "fracturing," loss of critical thinking skills, and emotional influences of their analyses. And many of us who are not as far along in the process have our weak points where we are susceptible to being swayed--one can never be too vigilant. Truly--"knowledge protects." I too know that how people react, physiologically and mentally/emotionally, to grave trauma is often very different from what we have become conditioned to expect from films and TV. I think the influence these media have on our perceptions of reality is constantly underestimated. After looking at the pictorial evidence I see no signs of a pressure cooker bomb being detonated. Follow the links and see for yourself. If you see something different please enlighten me. The next question gets to the heart of the matter. If a pressure cooker bomb was not detonated how do we account for all the ghastly injuries shown in Joe's article and also in McGowan's series? Without reading the whole series it is easy to pick and chose isolated items to prove a point. The following is from Part 1 of McGowan's Series. I would like to hear from Joe and Niall their thoughts concerning the pressure cooker bomb. Believe me, I have read every word in every one of his 7 articles on the topic. The demonstration pressure cooker bomb in New Mexico was misinformation, nothing like the one in Boston. It used a different explosive - a high explosive. Most high explosives (except ammonium nitrate) have an excess of carbon, hence the small, dense cloud of black smoke close to the ground, quite unlike the diffuse gray smoke of Boston. The Boston smoke was exactly what you would get from setting off a few ounces of black powder. Black powder is a "heaving" explosive, not a "shattering" one, and needs to be tightly confined to be effective. A cup of BP inside a six liter pressure cooker isn't confined enough to blow off multiple limbs - maybe one leg, if the lid happened to hit it right. I'm skeptical about the "actors" theory, but still don't believe we've been told the truth. "The crisis actor meme has it's proponents (McGowan) and distractors (SOTT Team)." I guess you meant "detractors". It's an interesting Freudian slip, no? Troubled or distraught: "distracted with grief". I also don't know what to make of the actors theory. From the images I've seen it sure doesn't look like a pressure cooker filled with nails, BBs, ball bearings, or rusty roofing nails was detonated. But how do we explain the casualties? My apologies. You are correct, I meant detractors. You are also spot on as this being a Freudian slip. I make no claim to have all the answers and this incident does confuse me. One thing I do think is that no pressure cooker bomb was detonated in Boston. The images I've seen show no evidence of shrapnel riddled bomb sites. I can see no evidence of any kind of bomb damage with the exception of the human casualties. The buildings show no shrapnel damage, same with the temporary fence, etc. So yes, quite confusing. "I'm skeptical about the "actors" theory, but still don't believe we've been told the truth." You're missing the point Sparks. You haven't been told the truth; the Boston Bombings were a false flag attack. The actors theory is a separate issue. The way you've written that sentence shows you think it's either the actors theory or the govt. 's theory. It's just another false-flag terror attack carried out by people who are very good at it, have no qualms about doing it 'to their own people', and who have had lots of practise doing it in other countries. This is what the whole War on Terror thing is all about. They set off bombs, blame it on Muslims or whoever, then cash in on the security hype and increase their power over you by taking away more of your freedoms. Straight to the non recyclable bin. what I wrote must have been really bad for it to get the straight delete button. That comment just had to be made and the swear word in it wasn't that bad. Really, you can only ignore it for so long before it rears its ugly head in a huge way. Anyways, I shouldn't have brought in the boys from upstairs but really, there are 2 camps and no one will change. You guys wont change your view and Mcgowan most definitely wont nor will most of the people who believe the actor thing, may be some might? All we are going to get is endless bickering. Guess one can avoid that by simply not scrolling down to read the endless stream of comments which will end up going absolutely no where. "Excellent work" etc etc and others will go like, I don't even know, whatever the opposite of excellent work is and then both parties will start commenting on each other and by the end of it all, we'd have hardly moved a centimeter. I can also only dare imagine what would happen if Mcgowan got wind of this and decided to do his own hit piece, God, the Ocean will all of a sudden turn into a whole universe of water and you know what will happen by the end of it all? Zilch, zero, nada, absolutely nothing. Can we just save ourselves from having to go through all that for like a centimeter of gain? Anyways, good luck and I hope you guys have a whole load of stored up energy. Yeah, but apart from the ones who like to post and rant and rave, there is a silent majority (perhaps) that reads and understands. Can't forget them. Could be true about this silent majority. They don't hold as much power as you think though, (or rather as I think), as soon as they dive in, they'll quickly realize how mucky these waters are..
Anyways, thanks for rebutting this whole actor thing, at the very beginning, from a personal point of view I thought it was a ridiculous idea but not an impossible one, I mean, "is it really beyond the realms of probability? and it sounds so outlandish that it makes it something that this all pervasive power that controls the world could actually pull off", at the end of the day, they've pulled of greater feats like gained absolute and total control over a whole planet with 8 billion people and there power seems so overwhelming as to make them absolutely godlike, I mean, they are everywhere and no where at the same time, some people (conspiracy theorists) know they are there but have no idea where, it's absolutely staggering the scope and depth of what they are about. But yeah, sound logic on why they wouldn't need to go to such extremes when doing the actual deed is good and authentic enough. Can't McGowan simply wait a month or two and go out and meet the injured 'actors'? Why such a hurry? The entire Web was in a hurry to find the stage, anyway. It takes time to check facts, and he usually takes more time to do his job, like with his previous works, or so it seems. Thanks for the article. This new level of propaganda is really playing soccer with out eyes. Will anyone remember the two hooked brothers after all that smoke? Perhaps the PTB are doing a check to see how much our software has been scrambled. And then proceed to the next level of Social Engineering at its finest. This is, in fact, a new form of Malware being spread all over, and we definitely need a new antivirus' build installed! I wonder what stressed (or damaged from stress) mirror neurons do to a human's thinking functions? It seems that the widespread belief that reality has become fantasy, in which all and nothing is true, indicates that many many people (like, most people?) are exhibiting signs of brain damage as a result of all this constant state terrorism (which isn't limited to false-flag attacks like the Boston Bombings; there's also egregious financial crime taking place in full public view), increasing crime rates, police brutality, extreme weather events, etc). I'm also thinking here of all the other 'foiled' FBI terror plots that constantly run in the background and trigger people's 'paranoia switch', as Martha Stout termed it. I wonder if the stress from all these things combined has damaged most people's mirror neurons in such a way that their 'theory of mind' as to what others are thinking about - which is fundamentally dependent on being able to correctly read others' emotions, empathize with them and thus place themselves in their shoes - is now beyond repair? It's like the circuits in their 'reading instrument' for more or less correctly perceiving reality are fried? I'm not sure how else to account for the claims that "Jeff Bauman didn't show enough pain in his facial expression", or that "none of the victims showed signs that they were experiencing concern, fear or shock", or that "the victim's father was laughing", or that "her eyes were too dry to really be grieving", or that "his voice wasn't shaking enough"... you get the idea. It's as if those who appeal most to reliance on reading the bodily and facial expressions for psychological cues (and clues) in these mass trauma events are those least able to pick up on and correctly interpret those cues? We'll keep plugging away and try to bring sense to the madness, but in the meantime, I'm afraid to say that whole swathes of people are simply... gone. Maybe the 'Zombie Apocalypse' is already here? "We'll keep plugging away and try to bring sense to the madness, but in the meantime, I'm afraid to say that whole swathes of people are simply... gone." "Maybe the Zombie Apocalypse is already here?" So, all the people who have legitimate questions that weren't answered in Joe's article are "simply gone" and possibly "zombies?" Interesting take. Could almost be classified as a personal attack. Could you please point me to any images of shrapnel riddled buildings at the bomb sites. I haven't found any as of yet. "Could almost be classified as a personal attack." I was thinking more along the lines of the 'Zombie Apocalypse' meme being a product of a mass consciousness that is fracturing to the extent that it actually believes such an eventuality is imminent, thereby 'making it real'. It's not real of course, but in the minds of many it has taken on the 'feel' of reality; their minds are now such that they waver between seeing it as a cultural joke and a very serious existential threat. The zombie meme began in jest a few decades ago, with a few movies and comics released now and then. Today there are TV shows, annual zombie parades in most big cities, documentaries on the 'science' of zombies where accredited scientists apparently take zombies quite-to-pretty seriously. Someone who somehow hijacked the DHS-managed Emergency Broadcast Channel earlier this year broadcasted a pretty frightening 'Zombie Alert' message in 6 or 7 states. Then there is the widespread zombie franchise in the firearms industry, the guy who shot his girlfriend to death because she didn't believe the Zombie Apocalypse was imminent ('like they said on TV') and the US and UK govts' 'mock' drills and recently published emergency preparedness documents on 'Continuity of Govt' plans in the event of said Apocalypse. It's as if there is, as one commentator put it, "a campaign [afoot], aimed at erasing the line between reality and fantasy - between what is objectively real and what is make-believe." It seems to me that what is objectively real is that there's a storm a-comin' that most people won't survive because they built castles in the sky and moved into them. what about woolwich and mr. morris? Topic related, even 108morris, a low profile analyst supports the hoax theory. Another question: With today's tech, isn't it possible to break the threshold between reality and imagination? One could fabricate a cloned zombie army(or make some robots for that matter with makeup, not so difficult). One could crack the comms backdoors and transmit fake "real news" about an imminent apocalypse. What could be the motive? Trauma based programming. You can see the connections between hollywood gore splatter films which are being aired with the ton(hostel, saw series, piranha 3d and so many more where you can see one million ways to lose some limb, your skin, your eyes, your head, everything with full gore) and the recent sh, boston, woolwich. Isn't this "imagination(sick) comin' to life"? Most everyone in alt.news circuits has been taken down by the 'HOAX! virus'. over reality. The extraordinary levels of 'substitution and selection of data' indicate that people are trying to block out - to prevent from happening at any cost - the following fundamental realization: they cannot accept that members of their own govt. would kill innocent people. They can accept that said govt. could PRETEND to do so, but actually kill people? No way, we can't go there, sorry! Being raised in an environment where the flag is saluted and an oath sworn to it every morning throughout a person's formative years, all the while being continuously bombarded with propaganda about what a Great Nation the USA is, has permanently brain-damaged many if not most Americans. They will believe until the very end that their government has at least some decent people in it, without knowing their history and understanding that all conscience was flushed out of it a long time ago. I think this is why they become so emotional and hypersensitive when it comes to discussing events like the Boston Bombings or the Sandy Hook Massacre. Those few who see that these events really did happen - and can see that the govt was behind it - are being screamed at hysterically and accused of working for the govt because they don't see that it was 'obviously' all hoaxed, a staged set with actors, props and costumes. Hollywood is much more real to Americans than reality could ever be. I mean, everyone loves a happy ending right? "The psychological features of crises are unique to the culture and the time, but one common denominator that exists at the beginning of 'bad times' is an exacerbation of society's hysterical condition. The emotionalism dominating in individual, collective, and political life, combined with the subconscious selection and substitution of data in reasoning, lead to individual and national egotism. The mania for taking offense at the drop of a hat provokes constant retaliation, taking advantage of hyperirritability and hypocriticality on the part of others. It is this feature, this hystericization of society, that enables pathological plotters, snake charmers, and other primitive deviants to act as essential factors in the processes of the origination of evil on a macro-social scale." The comments in support of the 'actors' theory, and even those expressing so much doubt about whether they are in support of the 'actors' theory or not are absolutely fascinating to me. I would even go so far as to say that this entire 'actors' concept is one of the most successful counter intelligence psychological operations since the 'turn on, tune in, drop out' psyops against the burgeoning counter culture movement of the 1960s. For those of you who are falling for the 'actors' nonsense, and even for those of you who are confused by it all - you are being manipulated in order to completely remove you from the playing field of rational inquiry and social/political action and impact. The drug of choice this time isn't LSD, it's fantastic lies fueled by emotion and entertaining 'spy versus spy' narrative - devoid of objectivity - that leaves you standing in a field of disinformation instead of where you should be: seeing and spreading the truth about the wholesale dismantling of society that is happening right now all around you via false flag shock attacks on western society that allow further clamp down and control of each and every one of us. I also find the comments fascinating. So much attention is being spent on emotional topics. I prefer to concentrate on the physical evidence. Some sort of explosion obviously took place. But none of the images I've seen show signs of a pressure cooker bomb filled with nails, BBs, ball bearings, or rusty roofing nails being detonated. I see no shrapnel damage to the buildings, temporary fence, etc. Most peculiar and yes confusing. I don't see how this explains the lack of physical evidence at the bomb site (shrapnel riddled buildings, temporary fence, etc.). I also find fascinating I've asked Joe and Niall to please explain this anomaly and as of yet I haven't gotten a response. I understand they lead busy lives, but they have found the time to comment on other aspects of this incident. Niall in particular has 4 or 5 somewhat lengthy posts since I posed the question. Since you don't seem to be confused about this incident maybe you can answer my questions. Where is the physical evidence of a pressure cooker bomb filled with nails, BBs, ball bearings, or rusty roofing nails being detonated at the finish line of the Boston Marathon? Do you know where I can find images of shrapnel damage? This would greatly clear up some of my confusion. Thank you. It is fascinating. People are essentially self-medicating by getting 'hooked' on the next most outrageous 'Konspiracy' claim, with each one more hard-hitting and 'blow your mind wide open' than the previous one! And because it leaves truthseekers like junkies constantly in search of their next hit, they're taken care of in the same way Black Americans were by the CIA flooding cities with cocaine in the 80s. But being able to vector and neutralise your targets with information instead of chemicals; well, that's taking things to a whole new level! "for those of you who are falling for the actors nonsense and even for those of you who are confused by it all - you are being manipulated in order to completely remove you from the playing field of rational inquiry and social/political action and impact. The drug of choice this time isn't LSD, it's fantastic lies fueled by emotion and entertaining 'spy versus spy' narrative - devoid of objectivity - that leaves you standing in a field of disinformation instead of where you should be: seeing and spreading the truth about the wholesale dismantling of society that is happening right now all around you via false flag shock attacks on western society that allow further clamp down and control of each and every one of us." "you" as "us not being manipulated vs you the manipulated ones". It is fascinating how the authoritarian "ego structure" kicks in whatever the background.. alt.media, mass media, fiction, reality, everywhere. maybe this is one of the viruses. How do you know for certain that the explosive device was a pressure cooker bomb? All we have to go on this is the official word. And anyway, are you seriously suggesting that no bomb went off?? In answer to your question please see the following from my post: "I also find the comments fascinating. So much attention is being spent on emotional topics. I prefer to concentrate on the physical evidence. Some sort of explosion obviously took place. But none of the images I've seen show signs of a pressure cooker bomb filled with nails, BBs, ball bearings, or rusty roofing nails being detonated. I see no shrapnel damage to the buildings, temporary fence, etc. Most peculiar and yes confusing." My I ask why you aren't interested in the physical evidence? Doesn't critical thinking demand looking at the crime scene? I have no problem with you not answering my questions about the physical evidence. That is your choice. Just say you have no interest in the physical evidence and I will take that as your answer. Any answer would be better than you avoiding answering my questions. I very much enjoyed SOTT's "Pentagon Strike Flash Video." You made a strong case of a Boeing 757 not hitting the Pentagon on September 11th. You did this by concentrating on the physical evidence. Why not the same concern for the physical evidence with the Boston event? What has changed at SOTT? Nothing changed at SOTT naturalden. That's why we we're the only alt.news site that hasn't at least contributed to spreading this actors virus. Niall, re: "Fantasy is preferred": yes, in keeping with Lobaczewski's findings regarding the hystericization of society ("The mania for taking offense at the drop of a hat provokes constant retaliation, taking advantage of hyperirritability and hypocriticality on the part of others. "), we can see (article reposted today as a Flashback) this mania reaching ridiculous, surreal proportions even last August (before the psy-ops crimes perpetrated at Sandy Hook and the Boston Marathon) when a Nebraska school board was pressing the parents of a deaf 3-year-old to take action to modify his S.E.E. (Signs Exact English) hand gestures representing his name (gun hand sign being used for his name, Hunter): [Link]. Anart, re: "Fascinating," yes, totally agree - we now have PTB "meta-level" psy-ops being inflicted upon mass populations to the extent that these criminal operations against us are now designed and spinned to play on (and prey on) the expanding sensibilities and awareness levels of the masses. As most of us are already well aware, anyone wishing to get beyond the glamour-and-illusion-bubble fabrications vomited upon us each and every moment by the main-stream media (MSM), in an attempt to see as clearly as possible through researching and processing just what the hell is going down, is subjected to navigating a hostile, labyrinthine gauntlet of psychological obstacles and weaponry. That is, anyone setting on the path of piecing together the facts and details of these false flag operations (especially, perhaps, the more recent ones); particularly those engaged in efforts to connect the dots between/amongst pieces of the overall propaganda programming puzzle (e.g., Cosmic COINTELPRO), runs the risk of becoming disconnected empathy-wise (the head may be utilized so much in reaching for objectivity that the heart may be dragged behind like an unwanted or outgrown toy; or, at the very least, less utilized, less engaged). During this psy-ops campaign, illusion-reinforcing, disinfo memes like the reality-blurring actors hoax type of lie can then be injected into the mass consciousness to create further confusion, diversion, vectoring, and time/energy-wasting manipulation via wheel-spinning and tail-chasing mental acrobatics, all of which can then profusely pollute the truth pool and compound the splintering effects of the pervasive, divide-and-conquer strategy of fracturing the consciousnesses within individuals and the relationships amongst them. Therefore, in touching again on the importance of remaining vigilant re: the link to empathy, as is illustrated in the extremely relevant and uplifting SOTT Talk Radio broadcast this past Sunday ("Empathy Trap: Breaking Free From Psychopaths and Sociopaths" [Link]), we can no doubt see with ease and increasing clarity the inherent value of balancing head and heart activities (reaching for objectivity while simultaneously remaining grounded in compassion / empathy, the sort of empathy displayed so well as shown here [Link]recently by the wonderfully compassionate Turkish people protesting their deplorable fascist oppressors). "I think this attack was specifically designed to maim, to cause these horrific injuries, and so much to kill, just for this numbing, hypnotizing and mesmerizing effect it produced in many people. And how come that people seem to have lost all their compassion for the injured and killed? Just stop for a minute, and think, how would you feel, if something like that happened to you, and multitudes of people started to accuse you of being a fake? For example, in the video that Joe mentioned above, posted on Dave McGowan website, the person making so-called analysis is chuckling and laughing! It's simply disgusting!" People there holdin' kemal ataturk's posters are not fightin' against their fascist regime(which until recently was their leader and blah blah). kemal has caused much suffering to the area, genocides, hunger, death hunts against other populations. so when you see turkish people carrying kemal posters do not think they want to get free or something like that. Seems that the "actors advocates" simply cannot deal with the fact that our psychopathic government can and does institute operations that kill citizens, that they in no way, shape, form or fashion, have the best interests of the citizens in mind. And so the actors advocates make up this fairy story to protect themselves from the freaking HARD REALITY that the US is now a fascist state catching up with the Nazis in terms of terror tactics. Do you people get it??? Your government is KILLING YOU without an iota of conscience! They aren't using freaking actors just to scare you as if you were little children. But you are acting like children making up this story based on mis-information, disinformation, assumptions, and planted false clues, to defend yourselves against a much harsher reality! Now really, which narrative do you think the Gov. murderers WANT you to believe? Haven't we known this since September 11th, 2001? Your "Pentagon Strike Flash Video" did a great job pointing this out by emphasizing the physical evidence. It seems like this actors thing might also be a block. Instead of seeing that their government kills them without impunity, they rather believe an elaborate hoax. Naturalden, does it matter that it was a pressure cooker or a different bomb? What would change and how could there be a proper analysis of the evidence when we barely get a trickle and just can go by pictures? This bombing has limited data, the photographs have been used to prove fake blood, but later on show that the hue/color settings were different (which happens to cameras- or photoshop used). Instead of looking at the big picture, the lies surrounding the brothers killed/arrested for the crime, we are focusing on blood/no blood, legs/no legs. How is that any different than 9-11 where instead of looking at the biggest issue, the Pentagon, people nit picked about hologram planes at the WTC, etc? As far as I see it, what surrounded the events with the brothers is what we should be focused on to show a coverup. Why does it matter whether one type of IED was used or another? I can see how it MIGHT matter (a little bit) at some point in time. Let's say it emerges a few months down the road that the bomb was actually placed inside an adjacent or nearby building, forcing an official statement along the lines of "our info. back then was wrong - the bomb was not a pressure cooker placed inside a bag left at the scene" or whatever. It might make some question how the Tsarnevs were responsible because they've been conditioned to believe they carried the bombs to the scene in their bags that day. But that doesn't change anything as far as you and I are concerned. We already know they're patsies based on the circumstantial evidence that's available today. Whatever the nature of this 'damning evidence blowing the whole thing wide open' in terms of getting the public to see en masse that the event was a false-flag, the official story would simply adapt, as it has done time and again for many mass trauma events, and it would remain nothing more than a tissue of (slightly adjusted) lies and a cover-up to protect the real perps. Granted, it would probably weaken the govt. 's credibility because some people would go "hmm, they're either totally incompetent or... they're lying." But that's the best you can hope for. Now, would evidence that the bomb was not a pressure cooker and was in fact something else necessarily tell us anything more about who the actual perps were? Maybe, if the shaped charges or whatever 'newly discovered' device said 'Made in Israel' or could be traced to a particular company or something. But the public generally isn't made privy to that information. And if they are, then you simultaneously have to be asking yourself "Did someone publish that rather damning fact because they WANT me to know? And if so, what are they playing at by doing so?" I think the problem here naturalden is that you really really want to find the smoking gun that's going to provide incontrovertible, physical, hard proof that the official story is a lie. We're up against master manipulators here who are very good at what they do. They've been doing it all over the world in many countries for decades now. Sure they make mistakes or things don't go according to plan, but because they can rely on the vast majority of people to WANT to believe their govt. 's version of events, they can get away with making up a totally fictitious tale about a wild police chase that ended in the deaths of two innocent young men. "A careful examination of the crime scene shows no shrapnel damage. If shrapnel was not the cause of the injuries, what caused them?" Maybe you're right. Maybe there's no shrapnel lodged in any of the physical surroundings. But are you willing to hang your hat on that as being a fact? Let's turn this around for a second, just as an exercise in logic. Humor me! What if neither you nor me, nor any other member of the public who was not actually surveying the crimescene AND is not a suitably qualified person to investigate and determine the presence or otherwise of shrapnel, are not in a position to positively determine that there was no - zero - shrapnel damage at the scene? You wrote "A careful examination of the crime scene shows...", implying that you have determined, based on the publicly available photographs, that because YOU cannot see any shrapnel damage, then that means there was NO shrapnel damage. And you determined that based on photographs that were taken at random by bystanders, not photographs that were presumably taken later by the crimescene investigation team and other emergency response personnel who are trained to know what to look for. Are you still absolutely sure that you know what you did or did not see? Not so. Many Americans (and many others in all nations) ALREADY cannot distinguish reality from fantasy, hence they are coming up with these childish fairy tales to avoid growing up and seeing reality as it is, and not as they wish it to be. Thank you Laura, though it is disparaging (and surprising) to me, that far too few on sott are even getting this as of yet, sheesh! I don't see how this explains the lack of physical evidence at the bomb site (shrapnel riddled buildings, temporary fence, etc.)." Ok, so next step is you question the whole pressure cooker thing. What about if that is a lie? What about if that was planted to make it appear like some brothers carried out the attack? What about if what went off was not a pressure cooker? What do you think? What do they accomplish by using actors, if you think actors were used? How does this compare to just carrying out an authentic attack on real unsuspecting people? Thanks Joe for the hard work and the struggle for Objective Reality. Interesting how many comments this article has generated. You must have really struck a nerve. PS Love your SOTT Talk Radio as well. Can't seem to make myself available as a caller yet, but love listening to them later! I follow and read sott articles for a long time. Thanks sott Team for great work! And thanks Joe Quinn! Actors: Actors being involved etc. No Actors: No actors where involved etc. 1. Image with description "Jeff Bauman with 'Team Stork' members" is FAKE, just look at shadow and pink lines on bottom of that image. I can give more info even show original source of that image. 2. Some mention only in other words "No Actors" believe "Actors" are WRONG because Government do kill innocent people, so why would they get so many actors and create a fake show? This don't show or prove actors being involved or not. From my understanding both sides know government don't care about people and kill many innocent people. So that is wrong argument. 4. Most (if not all) REAL or FAKE terrorist attacks are made by government. Its hard to believe all flesh would be gone from a bone after explosion no matter what it was. You wrote: "Its hard to believe all flesh would be gone from a bone after explosion no matter what it was." "Supersonic blast waves tear at flesh and muscle, pull off limbs and drive shrapnel deep into human bodies: It's a profile of violence at the Boston Marathon that is all too familiar to the U.S. military." "An explosion's blast wave emanates at nearly twice the speed of sound, starts low to the ground, then rises at an angle of 35 to 40 degrees before dissipating rapidly, says retired Army colonel Todd Dombrowski. That's why it takes out so many guys at the legs," says Dombrowski, a doctor who worked with the Pentagon's program to counteract roadside bomb attacks in Iraq and Afghanistan." "The kind of homemade bombs that exploded in Boston — improvised explosive devices — became the No. 1 killer of U.S. troops in Iraq and Afghanistan, leaving thousands more with major and often multiple amputations." And it's not only US troops who suffer these kinds of injuries, it's the civilians in the war zones as well. 1. That is not a fact. That is your opinion. 2. Based on the available evidence, I doubt it. The hoaxers live in fairytale land. 3. Right, but it would be the first time they used actors, a stage set and props to make a pretend terrorist attack. 4. All of them are. I understand that it's hard to believe, I really do. You've been living the American Dream and now you're waking up from it to see this nightmare going on, but this is daily reality in Iraq, Afghanistan, Yemen, Pakistan, Somalia, and elsewhere thanks to the very same government that blew up Jeff Bauman's and 14 other Americans' legs. You are correct, don't need to believe anything. Just ignore that last line. Do you have any comment on rest what I wrote? I have a comment on it. As I mentioned in my other post above, this was a BLACK POWDER bomb. Black powder's blast wave does not expand at "twice the speed of sound", especially when it's already dissipated most of its energy expanding to 100 times its volume before it even overpressures its container. If I wanted to make a scary bomb that probably wouldn't do more than bruise close bystanders, a cup of BP inside a 6 liter container would be just the thing. This is not at all the same kind of IED found in Iraq. Your linked USA Today article is garbage. 1. Please look at shadows of two girls with Jeff Bauman image. One shadow goes left other right. Shadow goes similar as pink lines on bottom. From what I know about physics thats not possible if you have one sun. 3. Do you remember “Nayirah testimony”. She was payed actor to lie about terrorist act, witch never happen. Taking babies out of incubators by Iraqi soldiers in Kuwait. Thanks for understanding. Syria, Libya, Palestine, Mexico and many more could be added to your list. No way I could live or even believe in “american dream”. About usa, was never there. Prefer to keep it that way. Some of you people need to spend some time in a medical library or being taught, as I was, by a triage nurse who did several tours of duty in Viet Nam. As a preliminary to such an education, you might wish to go to google images, type in "war wounds", "war injuries", "legs blown off", "arms blown off" and other such enlightening terms. Brace yourself, don't even think about eating for a few hours. All right, so two days ago I asked several people who have extensive knowledge when it comes to anatomy and medicine in general. I asked what can happen in case of amputation, and why there may not be that much blood as expected. The answers were pretty much consistent with what Joe already said in the article, with a bit of additional info. First, it depends on a type of amputation and wound. If it was a clean amputation, so to say, then there would be much more blood and chances to survive would be much lower. But in case of an explosion, due to external pressure and the wound being ragged and all, it contributes to much quicker termination of the blood flow. Another fact that was mentioned by Joe, that amputation indeed causes peripheral blood vessels to constrict. As for the nonsense of femoral artery being severed, just open anatomy atlas and do your homework. In any case, do your homework and use your head instead of embarrassing yourself. I don't pretend to know all the details concerning the Turkish peoples' uprisings (and that was not my point anyway), but I do know, as seen in the posted photos at that link above (given here again [Link]), true demonstrations of empathy, compassion, teamwork, and solidarity when I see them (people helping people by providing support by way of offering water, food, etc; people helping animals injured by police tear gassings; and animals showing appreciation of aid by showing affection, etc). So my point was that, as opposed to the creeping (actually blatant these days) fascism popping up all over the place and huge swathes of subsequent apathy and/or infighting of the oppressed manifested in its wake; these are heart-warming pictures of empathy and compassion in action (likewise, despite the fascist police's use of pepper spray, night-sticks, water cannons, tear gas, and body-crushing tanks). Regrettably, these constructive and unifying qualities are something which is in short supply these days, at least from what I usually see and experience in the US, a place that is getting more and more fractured, moment by moment; and where it is now a crime to feed and/or give money to the homeless [Link](which, btw, is not as common a practice as we'd like to see, either before or after these insane laws were crafted and handed down). Let's face it: we have, unfolding before us, a polarization here of those falling for the actors hoax meme / theories and those who are not (not including those who are undecided, etc). I am annoyed when in an open minded site like this one we engage again in flame wars rather than having a conversation. As for turkish people revolting, as I pointed out, many do not know why they are revolting. I believe that social media have become big brother style media. And as I know, people's reactions are way different when they are being monitored. No natural reactions when being observed. Or quantum speaking, the observee tends to change reactions when being observed. I believe this applies to the demonstrators. A brief browsing of social media can confirm this. "the revolution will be televised" motto from back in the days. You see all these you mention, compassion and like but in the big picture what will be the consequences? Kemalists vs islamic elements? Kemal was not a pacifier. He brought terror. On the other hand, we can see what is going on in syria and what was the aftermath in libya. The springs there are not so innocent. Libya destroyed and now with imf. Syria destroyed. Turkey now. And then? Army coup? and then what? all out war on greece? I strongly believe the turkish revolt is being fueled for underground reasons of the ptb. As was the greek people at syntagma sq. which ended in a massive failure and a divide and conquer effect between the demonstrators. Now they fuel the loylals to erdogan in engaging with the anti erdogan pro kemalists. It's all politics. Nothing innocent. So when I see revolts like this, I kinda know the result. The result being NOT in favor of the people. Believe me when i say that US are not so different from Greece, Spain, Portugal and like... the economic fallout combined with the shock and awe tactics against people, has turned the people to hatred ill beings. Of course in Greece it is illegal(!!!) to pass your public transport ticket to another person. And when you try it, half of the people will curse you because "they pay and you give your ticket to another one?" "the state loses taxes!". Hatred all around. I read your link concerning c's last comm. To sum up, believing the lies creates an electromagnetic charge causing cataclysmic events.... It is demoralizing... Civilizations upon civilizations have been built on tremendous lies. 99% of what we hear is a lie. we are doomed. Dude, no flame wars are intended here from me, just clarifications and discussions of my point of view. Greece has been and continues to be subjected to so much PTB inflicted torture and suffering. I extend respect, honour, and empathy to her people and to you. Thank you for replying and reading the other link. "a lightsaber, hmm an elegant weapon for a more civilized age"... Now a lightsaber would cauterize the trauma resulting to minimum blood loss. Then a droid doctor would adjust a biomechanical limb to the victim complete tuned with natural neurons resulting to 100% active biomech limbs. Indeed, a more civilized age... a long long time ago. Yep, and a 'light saber' theory proponent would similarly need to produce light saber evidential data to support the theory. Don't kid yourself. You really ARE that ignorant. Is there any reason that the main themes must be mutually exclusive? Is it impossible that this street theatre is indeed a false flag and that sombunall of the apparent victims are also false? It's not impossible, but like much of what 'pattern-seers' like RAW and DMcG think they're seeing, it's very unlikely. Now that things have calmed down, it is absolutely clear that nobody was injured and, certainly, nobody was killed during either of the Boston Marathon "puff-bombings (this absurd article notwithstanding) and that actors (including the "amputee"-type) were used in this fraud against the American people. SOTT should be ashamed of themselves for this tripe. Google 'boston bombing victims recovering hospital'. There were real injuries, you can tell it from the latest footages released on March 2015. Mistake was some of the "close encounter" footages were held secret until recent past. There is nothing to trust regarding the government and presumption of hoax is always valid. I give you reason and example - do you really believe the Sandy Hook shooting was real? The presumption that authorities lie is valid, but the presumption that they stage such events rather than actually carry them out then blame patsies is completely cuckoo. This is your common patsy "politics", are you really that sure the government has not moved even further? Don´t blame them, because they had tons of reasons to be suspicious about the whole even, and THEY STILL DO HAVE ... have you forgotten photos of the strange guys from The Craft company in uniforms and black backpacks standing and hassling all around the place, even directly at the 1st bomb explosion site? ... Come on, you can´t be serious not giving the conspiracy theorists their righteous credit, because there, hell are always some unexplained and secret held things around. It is the arrogance of those at power, and all the secrecy which is guilty and the real cause of misunderstandings, not lack of critical thinking of the conspiracy theorists, they have it, and are way more healthy than those who without doubts accept anything and each official version. And again - look to the Sandy Hook stuff, and please don´t tell me you do believe it was real. So, if one hoax is real, how can you trust anything else or others? Don´t forget the FBI uses agents to lure patsies to terror attacks. It is your courtyard, keep it clean by yourselves. "Don´t blame them, because they had tons of reasons to be suspicious about the whole even, and THEY STILL DO HAVE ... have you forgotten photos of the strange guys from The Craft company in uniforms and black backpacks standing and hassling all around the place, even directly at the 1st bomb explosion site?" We investigated the 'Craft' reports and photos. It was never established with any certainty just who those guys were, but yes, we can assume they were either in on it, or thought they were going to be in on another version of events (a drill, or bomb scare, perhaps) until it - unexpectedly, from their pov - 'went live'. "Come on, you can´t be serious not giving the conspiracy theorists their righteous credit, because there, hell are always some unexplained and secret held things around. It is the arrogance of those at power, and all the secrecy which is guilty and the real cause of misunderstandings, not lack of critical thinking of the conspiracy theorists, they have it, and are way more healthy than those who without doubts accept anything and each official version." Imagine, for a minute, just hypothetically, that both the official version (the Tsarnaev bros. did it) AND the main 'conspiracy theory' version (it was completely staged with crisis actors, fake blood, no one died or was injured, the whole thing was theater, etc) are wrong, and thus their propagation serves to cover up the truth about what happened. In such a situation, are the conspiracy theorists a help or a hindrance to the perpetrators?? "And again - look to the Sandy Hook stuff, and please don´t tell me you do believe it was real. So, if one hoax is real, how can you trust anything else or others? Don´t forget the FBI uses agents to lure patsies to terror attacks. It is your courtyard, keep it clean by yourselves." What do you mean by 'real'? Was the school real? Yes. Were the victims real? Yes. Were the Lanzas real? Yes. Were the shooters real? Yes. Was the official story about what happened real? NO! Do you see how it isn't black and white? It's not 'either it didn't happen at all, or the official version is what happened'. The truth is neither of those things. Yes, the FBI uses agents to lure patsies to terror attacks. The vast majority of the time, the patsies are given fake explosives, fake detonators, etc. With so many entrapment plots and drills going on all the time, you can see how all it would take for a pretend event to 'go live' is the replacement of fake explosives with real ones. But replacing an entire Boston street with a fake one?? Possible, but extremely risky in terms of exposure and thus far-too-complicated an operation compared with simply swapping in real explosives for the fake ones. And why did the media use actors instead of real parents is explained by what exactly? The brothers did it, but were they all alone? Also, ask yourself, what if Boston was a need for something else, let´s say a smokescreen for West Texas Fertilizer "accident".? Don´t get bothered by the conspiracy stuff and read only about the law suit between TWF and Monsanto. "Conspiracy theorists" are the real watch dogs, you should value them as the best of the best you have. I thought the whole actors thing really started with Sandy Hook? It all seems like distraction to me - i.e. lets not talk about what occurred, local implementation of marshal law, patsy "terrorists" etc. I accept pressure cookers can be blown up ... but only if the pressure is increased which presumably means the device being powered by some means? "but the presumption that they stage such events rather than actually carry them out then blame patsies is completely cuckoo"
"A Texas traffic cop ...took down two heavily armed men bent on storming a building ...killing both before they could make their way inside" . .... "his reaction, and his shooting with a pistol, he did a good job" ...." two suspects, believed to have driven some 1,100 miles from Phoenix" ... "Two tweets ... linked to radical Islam ... sent at 6:35 p.m., some 15 minutes before the attack"
So Pinky & Perky drive 1100 miles, armed to the teeth ... 15 minutes before the attack they tweet their plans and when they arrive, they are taken down by a traffic cop with just a pistol??? Presumably the damage to their car was just due to ricochets from the pistol?